NASHVILLE, Tenn. -- The Black College Fund’s support of 11 United Methodist-related historically black colleges and universities continues a rich Methodist tradition dating back to the Civil War era when educational opportunities were almost nonexistent for 4 million newly emancipated slaves. The roots of those historically black colleges and universities extend directly from the work of the Freedmen’s Aid Society, which was organized in 1866 by the Methodist Episcopal Church to begin providing formal education to the freed men, women, and children. The original charter of the Freedmen's Aid Society that was founded by Methodists just after the Civil War is archived at the General Board of Higher Education and Ministry office. Photo by Donnie Reed for GBHEM. “The Black College Fund (BCF) continues to follow up on the mission that was carved out by the Methodist Episcopal Church right after the Civil War,” said Gerald Lord, staff executive in the General Board of Higher Education and Ministry’s Division of Higher Education. Original papers of the Freedmen’s Aid Society, including what is believed to be its incorporation document, are archived at GBHEM’s office in Nashville. Through the BCF, United Methodists support the largest number of historically black colleges and universities of any church body in the United States. Approximately 16,000 students are enrolled in the BCF schools, which are located in the church’s Southeastern and South Central jurisdictions. About 90 percent of the students qualify for financial aid. Funded through a churchwide apportionment fund – one of the seven funds that the entire UMC contributes to – the BCF annually distributes 95 percent of its money equally among the schools and awards 5 percent for special projects or activities. Every quadrennium, each school receives $250,000 for capital projects. The 11 schools are among 119 United Methodist-related colleges and universities in the U.S. Around the world, there are 800 colleges and universities in the Methodist tradition. Both private and state-owned institutions are included in the nation’s 102 accredited historically black colleges, which were all founded between the end of the Civil War and the 1964 Civil Rights Act. Open to all students regardless of race, they collectively represent about 3 percent of all U.S. colleges and universities, but they account for 16 percent of all enrolled African-American undergraduates. As the Civil War was ending in 1865, Congress established the U.S. Bureau of Refugees, Freedmen and Abandoned Lands, more commonly known as the Freedmen’s Bureau, to provide housing, food and medical aid to poor whites and former black slaves. The Freedmen’s Bureau also offered legal assistance and established schools in the South but was never adequately funded and was abolished by the federal government in 1872. The Freedmen’s Aid Society was one of scores of freedmen’s aid and relief organizations formed by religious and secular groups as the war ended and the Reconstruction period began. Most of the schools and colleges started by the groups were in Southern states. By 1892, a total of 447 teachers and 9,310 students, including 172 college students, were said to be a part of the teacher-training schools and higher education institutions started by the society. The Freedmen’s Aid Society, which actually was incorporated in 1870, became the Board of Education for Negroes of the Methodist Episcopal Church in 1920. It owned the property where all of its institutions were located, and eventually the property of all the surviving organizations was deeded to the Methodist Episcopal Church. Those deeds, in turn, were passed along to the Methodist Church, which was formed in 1939 when the Methodist Episcopal Church, the Methodist Protestant Church and the Methodist Episcopal Church South reunified after having been split since the mid-19th century. Then the ownership was passed to The United Methodist Church in 1968 following the merger of the Methodist Church and the Evangelical United Brethren, bringing together most of the U.S. organizations that originated from the early Wesleyan movement. 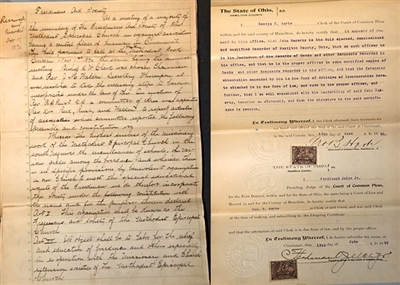 The actual deeds to the original properties are in the church archives, Lord said. Over the years, most of the property has been deeded to the individual institutions, although the church retains ownership of some small parcels. -- Tom Gillem is a writer and photographer in Brentwood, Tenn. Article courtesy of the General Board of Higher Education and Ministry.